Sinkhole on White House Lawn Reveals a Very Deep-Seated Problem in D.C. This swamp has a drainage problem. When pundits say “drain the swamp,” they’re usually referring to the cesspool of corruption flooding Washington, D.C. But that figurative swamp has similar real-world correlates that have recently caused a sinkhole to open up on the White House lawn. On Tuesday, one observant reporter tweeted a photo of the deepening, darkly poetic void for the rest of America to see. Voice of America reporter Steve Herman tweeted the photo with a caption explaining that he’s been watching the sinkhole grow larger for several days. The neon pylons and caution tape now marring the lawn indicate that the sinkhole hasn’t gone unnoticed by White House staffers, but they don’t seem to have done anything about it except bar people from coming near it. On Twitter, users variously called it a “hellmouth,” Melania’s “escape tunnel,” or an easy-access door for Satan to reach his minions. But jokes aside, the sinkhole is likely the result of swamp-like conditions suffusing the city. The pervasive myth that all of Washington, D.C. was built on a swamp has been thoroughly debunked, but that’s not to say there aren’t parts of it that are poorly drained. The spate of sinkholes that have opened up in D.C. in recent years has suggested that old or defective infrastructure is to blame for creating the swampy conditions that make sinkhole formation possible. Sinkholes, in general, form when the bedrock beneath an area is eroded over time by running water. This water may come from natural sources, like heavy rain, or it may be the result of leaking pipes or sewers deep underground. As the rushing water eats away at the rock, the foundation supporting the top layer of the Earth disintegrates. Eventually, nothing is left and the surface caves in. 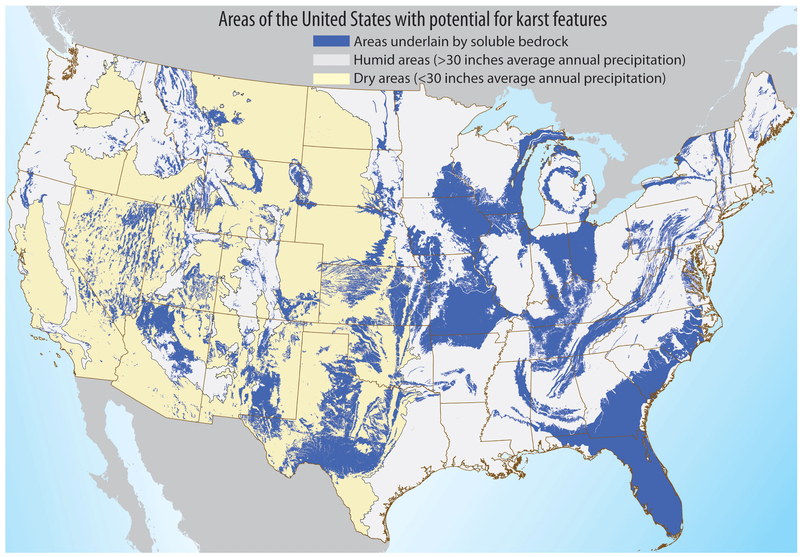 They most commonly appear in regions of “karst terrain” — areas where the type of rock underlying the land surface can be dissolved by groundwater. Limestone areas are sinkhole-prone, as are regions made up of salt beds or shale. While there are parts of Virginia, Delaware, and Maryland that are made up of karst, D.C. is not particularly karst-ridden. But it does seem to have a drainage problem. Karst regions are thought to be prone to sinkholes. There’s no official cause for the White House sinkhole yet, but if previous sinkholes in D.C. are any indication, it too is likely caused by a water leak from an aging pipe system. The current residents of the White House should be used to this kind of thing by now, though: In May 2017, a new, leaky water main outside of President Donald Trump’s Florida estate at Mar-a-Lago similarly caused a gaping hole to suddenly appear in the ground.